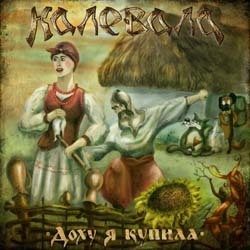 Russian folk metallers Калевала (Kalevala) from Moscow have announced the release of a new 4-track EP, entitled “Доху я Купила“. Like most of the previous works, the new EP will be released via SoundAge Production in March 2014. “Доху я Купила” was recorded, mixed and mastered in “Центр Тяжести” studio in Lyubertsy, while drums were recorded at the studio “Gigant Record”. Recording took place from February to March 2014. “Доху я Купила” will be presented at Kalevala’s concert at Rock House in Moscow on March 8th 2014, when it will be also released online. The band has revealed the album tracklist and cover artwork, illustrated by Dmitri Varg and Ivan Builov.